World War II was the bloodiest war to be fought in the history of the world. It is an extremely touchy subject for many countries and cultures, due to the sheer loss of life. It is also a very popular subject for video games, and there are countless games based upon the experience in some shape or form. Relic’s RTS series Company of Heroes separated itself from the pack of other WWII games. 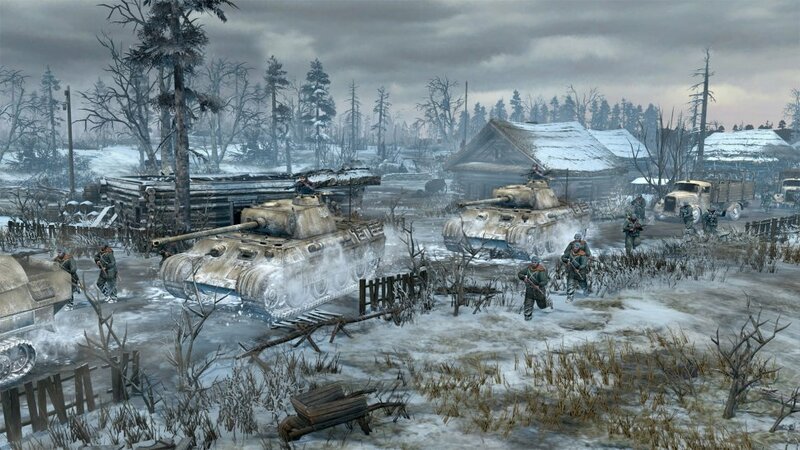 Their latest installment, the long awaited Company of Heroes 2, attempts to build upon the critical success of the first game and successive expansion packs. In doing so, they have focused on refining the original gameplay while adding a few modern gaming amenities. Company of Heroes 2 approaches the dreaded conflict from a different perspective. Most games that touch upon World War II star the Americans in some way. Relic has opted to tell the tale of the Soviet Union and German conflict. In the end, the Soviet Union was responsible for stemming the flow of the German war machine, but not at the cost of a staggering loss of life. Somewhere between 22 to 30 million Russians lost their lives in the conflict. The campaign chronicles the lives and stories of Russian soldiers during key battles of the war. Unfortunately, the cut-scenes are of comically poor quality, and at times can interfere with the flow of the missions. The voice acting is equally poor, depicting the all too familiar Russian stereotypes that will make you cringe. Story aside, the missions are actually quite interesting and diverse. There is great variation here, with some missions having you defend against German tanks, while another has you scouting with snipers in the freezing cold. The story missions are a great way to teach newer players the ropes of the game. Each mission features a new unit, ability, or tactic that will be used in the battles to come. Relic’s homage to the fallen Russians comes in the form of the conscript ability. A cooldown button present in many of the story missions, the conscript ability allows you to summon a group of weaker soldiers roughly every 30 seconds. What this ultimately equates to is the fact that you will have a lot of troops, usually weaker than your German opponents. You will often win through superior numbers and tactics, almost never by superior firepower. While historically accurate, it also presents a blunting effect on the campaign as a whole. Luckily, as is the case with any RTS game, the campaign is only a small portion of the complete package. Company of Heroes 2 is an extremely dense game, offering an immense value for your dollar. There are many options for players outside of the campaign. You will spend most of your time in the “Theatre of War.”. In the theatre, you can participate in three different types of games, fighting for either the Soviet Union or the Wehrmacht. Co-Op Scenarios are challenging conflicts that can be played with up to two players. Solo challenges are difficult challenges that feature limited resources and strict conditions for victory. AI battles are skirmishes against an opponent with specific conditions. Starting off in 1941, your selection of scenarios in the theatre is limited at first. As you complete missions with or without friends, your progress bar will accumulate, eventually unlocking future years of conflict and more scenarios. While it may be slightly irritating for those of us who want everything available from the outset, it adds great value to the game and an overall sense of completion and progression. The co-op missions we played were definitely tuned for multiple players. In one scenario we needed to survive four full days against the superior German tank army. The map would cycle through day and night and at the dawn of each day we would be reinforced with new tanks. A central point of the map was a key to victory and it was hard fought. My co-op partner and I would consistently send in a stream of Russian tanks to defend the victory point, but simply leaving them there to fend for themselves proved futile. One player needed to bait the superior German tanks while the other player flanked and finished them off. This yielded one of the most impressive visualization of WWII I've seen in any game. Dozens of tanks converging on a single point, the echo of the tank shells ringing in my ears, and a huge cloud of smoke as more and more poured into the battle.